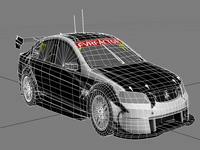 FVR would like to announce our newest mod and a first for rFactor - NZ Supertourers. We have been following the production of the newly formed category and building our cars from the ground up specifically for this series. For the first time we have gathered physics testers to make sure the feel of the cars is as good as we can get. We have the services of a driver of the series (we need to ensure he is okay with using his name). We have taken a lot longer to produce the cars and need to point out this mod is 100% scratch built apart from some possible ISI textures, this is not a simple conversion it is a brand new mod. At present we are also building Hampton Downs FVR style, predominantly for the rFactor 2 release of the mod but it is currently 80% complete for both mods. rF2 will be a limited release and updates required when rF2 adds features. Please bear in mind there are only three of us currently working on this mod as our sound man has disappeared due to personal commitments and a couple of testers. Apart from thanking our testers as we muddle our way through we'd like to thank the drivers and teams in the series that have assisted us and been extremely helpful giving us information that we really needed considering the series hadn't even started. We salute you guys and this is our thanks to you. Sorry for no posts - this mod got put on hold over the 2012 V8's which is on our website in rF1, rF2, and Race07. There is also a GTR2 version in beta. The rF2 version is not complete due to rF2 status but lots of people are enjoying it at the moment. Sorry we haven't posted here, we had to do the V8Supercars for rF1(although thats still on hold) and then recently got sidetracked and we released a beta version of our V8Supercars 2012 for rF2. We had a few issues with the MOD ID but we have worked out why we had the issue now. It shipped with early versions of Hidden Valley, Surfers Indy and Surfers V8, Sydney Homebush, Bathurst, Queensland Raceway and Sandown. All of these tracks are in our rF1 stable and are all scratch builds. We released an inhouse test of NZSupertourers a couple of weeks ago and it shipped with a couple of Aussie tracks. We are in the process of getting our Hampton Downs WIP working with it as well but that may take a couple of weeks as its a busy month in October. before thoughts of suicide take over. I need V8s!!!! Doug any updated screen shots ? Man need this and Hamilton, Know I am a bit late but could we please have a demo just for this weekend, or is it no where near finished?.